I were to engage in Repeated Reading for whole class Tier 1 instruction, what would that look like? Which of these would signal the beginning of quality instruction? Of course, it depends . . .
A. Telling. No instruction. NO! B. Rhyme and rhythm are important, but what is the driving WHY? C. Student goals sound like they are individualized and the talk about fluency and prosody sounds connected to student goals. Does it depend on the topic/event? Or a simple desire to “Be Better”? To “Do Better”? Is it the luck of the draw? The New Year? A need for focus? Whatever draws you to #OneLittleWord, do consider how that word will impact you for the next year. I’ve been considering words since #NCTE17, that gathering of so many talented friends with so much learning, love, and laughter all rolled together. Disquisitive caught my eye. (” 1. Relating to disquisition; fond of discussion or investigation; inquisitive.”) I tested it out and thought it would score well in Words with Friends2 but it just didn’t have the “OOMPH” I wanted in my #OLW. Prurient also caught my attention in a negative way as that was not a synonym that I was expecting. What’s your best guess at this point? What one word is a synonym for those in the Word Cloud above? It’s all about word choice. A visual for another hint . . .
Just seven letters . . .
How and when will you reveal your #OLW? When were you 100% sure that you had identified the correct word? How important are our words? What precise meaning do your words carry? Do your perceptions match those of your students? So much to consider in the area of building “word knowledge” in 2018!!! When teaching, goals and needs often become blurred due to perspective. Whose goals and needs are the basis for planning, instructing and assessing? When are student voices heard? When are parent voices heard? When does the community have input? This morning I had a lengthy conversation with Mya over coffee. Her needs seem simple: food, water, shelter, hugs and kisses, time to play. How many of those do I define? How many of those does she define? I laughed last week as she went nose to nose with an opossum and it was not playing. As Mya barked, the opossum snarled back. Not the quiet, placid Mya who walks among the deer without a sound. Not the quiet Mya who allows Harry the cat to tell her what to do. So I’ve been wondering what are Mya’s needs and what are her goals? On this foggy Sunday morning Mya has no need to head outside. She’s curled up on the love seat napping. She’s already had her breakfast, her treat, a bit of conversation and she’s now in her own little world. Are her needs met? Are her goals met? Conversation with Mya about basic needs is quite simple. If either her food bowl or water bowl are empty, she comes and tells me. Her nose on me is quite telling. No words are needed. And when she’s ready to play. OMG! YES! She’s bouncing. Or she’s patiently waiting. That stare. Those eyes! And of course, I’m well trained. When she’s standing, nose against the door, tail wagging, it’s time to open the door for her! What about balancing my goals and my needs? My initial draft of this post included a list of goals and a list of needs. As fast as I listed something in either category, I was deleting it and moving it to the other side. And then . . . . there were the list items that HAD to be in BOTH categories! Ay, yi, yi – not productive! Way too much thinking! Last week I had the pleasure of learning with and from Cassie Erkens (@cerkens) author of Collaborative Common Assessments: Teamwork. Instruction. Results. One important point she made was that we must understand the DNA (Desires, Needs, and Assets) of ALL students. Do we even “know” that information about our students? So that long conversation with Mya led me to realize this morning over coffee that it doesn’t really matter whether I can specifically IDENTIFY all my goals and needs. Instead living my life so that I BALANCE my goals and needs in service of being brave and remaining a life-long learner is important. Can you tell what I am working to “Balance”? How do you balance your Goals and Needs? How do you make sure that all voices are included? Check out the posts at Margaret Simon’s “Reflections on the Teche” for more ideas / thinking about balance! I’m still reeling from the information on goals in Jan Burkins and Kim Yaris’s post about the 1% of the population that set goals and regularly review them. It’s a short post. Go read it here. The numbers are staggering and the consequences for learning are dire if teachers are NOT setting goals in their classrooms. Let’s Review: How important are clear learning targets for students? Hattie, Fisher and Frey say that their effect size is .75 for “Teacher Clarity”. Teacher clarity could easily transfer to deeper student understanding of the desired learning target. Clarity in knowing what the target looks like would make the target easier to meet..
What kind of goals should teachers be setting for writing instruction? “Teach the writer, not the writing. Teach strategies for elaboration and development. What could goal setting look like? One way it could go is through the use of the goal and technique cards from this post. As a writer I could pull out the techniques that I have already taught for the writing types this year. I could list them in descending order by the frequency with which students are using the techniques. Then I could check the on-demand writing for the new unit and see which techniques are present. This is one example of using data to determine goals. and goal-setting to improve writing across the text types. Win/Win in Student Goal-Setting and Teacher Clarity! Are goals for the day, month, or year? Won’t there be a variety of goals and time lines? Perhaps there will be an over arching goal that all students will love to write that will have its own steps or mini-goals. Perhaps it will be to improve the quality of the students’ narrative writing during this unit. Perhaps it will be the goals for this week. But without clear goals . . . what learning path are you on? How could you use the techniques cards, goal cards and teacher clarity of work to improve your own writing and/or student writing? Reading Goals: What Do You Measure? Disclaimer: The ideas in this blog are not novel. They are not original. They are appropriately “sourced” where credit can be applied. What is new / different / novel is perhaps the thinking that connects the ideas. Research-based.ideas! Student-centered.ideas! Many folks KNOW this. But do the teaching practices match the teacher beliefs? How can students read more? B. Book logs that keep track of books read. Compare lists over time. C. Book lists kept by students that rate the books (scale of 1-5) and list genre. D. Independent reading during class time followed up with time to talk about what was read. Which ones of these have you tried and abandoned? Did they work for awhile but then student interest seemed to wane and it seemed like students were “cheating” and recording books that they really hadn’t read? Or perhaps books that students began to read but when the going got tough, the books were abandoned? Did you REALLY understand the goal / purpose behind that undertaking? Did you read the book behind the practice pushed into the classroom? Participate in a book study? Or did you find the pages on Pinterest or TPT and “try it” as a pilot with a high degree of skepticism. If you went to the link above for Donalyn Miller’s 40 book challenge and read and even digested that post, you read these two paragraphs. “The 40 Book Challenge isn’t an assignment you can simply add to outdated, ineffective teaching practices. The Book Challenge rests on the foundation of a classroom reading community built on research-based practices for engaging children with reading. Assigning a 40 Book Challenge as a way to generate grades or push children into reading in order to compete with their classmates corrupts everything I have written and said about reading. The 40 Book Challenge is meant to expand students’ reading lives, not limit or define it. This is just a small piece of Donalyn’s 40 book challenge. Reading one blog, one tweet, or attending one hour long session at a conference is not enough for deep learning. But it is enough to whet your appetite. Your appetite for life-long learning as well as your yearning for a solution that makes sense to you, your students, and your community will grow. Your appetite may lead to a mini action research cycle as you implement a research-based strategy in your classroom. A week ago a friend of mine asked on Twitter: “Does anyone have a genre chart they can share to encourage strong readers’ growth?” And Dayna had several results immediately. Relevance? What do you measure? If you go back to answer choices A, B, C, and D above, how do those match up with the goodreads list. I think 5 of the 7 data points are easily covered. Do you NEED 5 data points? Maybe. Maybe not. Do you need ALL 7 data points? Maybe. Maybe not. It all depends upon the ultimate goal of your independent reading. Who our students might become as readers? Is the purpose for a reading goal . . . to hold a student accountable for what they read? Or provide proof that they read and understood and (gasp) remembered a boatload of details to answer a quiz? Or is the purpose of the reading goal to provide an opportunity to NURTURE a love for reading? And to encourage / nudge EVERY student to become an avid reader? See “Let’s Not Kill the Love of Reading” by Dr. Tony Sinanis (@TonySinanis). Is the purpose to make sure that the teacher is helping all students to “BECOME a reader” (Thank you, Dr. Mary Howard – @DrMaryHoward) ? Section 2 of the table of contents is included so you can see the practices that support increased student achievement. “SECTION 2: WHY NOT? WHAT WORKS? Need more evidence? Check out “Three Keys to Creating Successful Reading Experiences” by Pernille Ripp (1/4/2017) and “Revisiting My One Classroom Non-Negotiable” by Christina Nosek. make sure that anything you ask require students to do is that which YOU are willing to do as well in your own independent reading life. discuss how you feel about your reading? review the text complexity of your own reading? Do your personal practices match your instructional practices? You MUST utilize some “lens” or filter to sort out resources. These are NOT all equal. A single number is NOT a goal! How does your goal match your purpose? What are you REALLY measuring? Kylene Beers facebook post about lifetime readers! even have students waiting for floodwaters to recede like Margaret in Louisiana. Whereever you live, the calendar is marching on, and school will soon begin. In 2015 this back to school blog post focused on relationships and learning priorities while the 2014 post here included blogs and quotes and Lucy Calkins’ challenge to “outgrow ourselves as readers”. And more recently, this #DigiLit Sunday post was also about planning for the new school year. Are you prepared? And what does that mean for you? Have you added some alternative seating? Additional partner seating? How do you allow the students to have some say and choice in the room arrangement? What does your library look like? Are students able to easily access books in the classroom library? Are your first instructional days planned? How will you greet your students? What is your first Read Aloud going to be? Your first mini lesson for reading workshop? Writing workshop? Your own first demonstration writing piece? And what about that first poem? Have you set your goals for the year? My wish is that every child will have joyful learning every day of school that will allow him or her to grow beyond belief in reading, writing, speaking, listening, thinking, math and research (science and social studies). Each classroom will have a skilled, enthusiastic and passionate teacher who focuses on meeting the needs of the whole child! Not sure if you are ready? Need some more ideas? Sarah Brown Wessling writes about her pledge to students here or check out this NEA Back to School Guide! What are your planning priorities right now? And what about personal priorities for your very own children? Are they starting a new school year as well? As a student? As a teacher? As a parent? What rituals do you share with them? My son and I had a first day “back to school tradition” of dinner out. Dinner out at a fancy schmantzy restaurant where we could talk about the first day of school and everything that happened away from the rush of meal prep or the stack of ever-present work. A joyful celebration of new beginnings! “Writing is an exploration. You start from nothing and learn as you go. 4. How do we know students are making progress in writing? 3. Close Reading in Kindergarten? Is it even possible? What are your top 10 learnings for 2015? What data do you consider? How are you reflecting on 2015? One post that is on both top 10 lists! #SOL15 posts were seven of the 10 most commented on posts! YAY, Slicers! 6 of the blog posts were originally published in 2015. Two were published in 2014 and two were published in 2013. How can we measure writing so students, parents, the community, and the teachers know that students are improving? If this is our definition of assessment, we have many options for measurement. If I am a student, I can use rubrics, checklists, my personal goals and feedback from peers, teachers, and those I communicate with through blogging, etc. to talk about what qualities are present in my writing now that were not there earlier in the year. This could be in the form of a summative reflection that is posted with two or three papers/writings that I believe demonstrate my growth and that I would have annotated with those specific qualities for a quarter or semester or across the entire year. But what keeps a student writing on a daily basis? How does a student know that this week’s writing piece is better than the last piece? Or that this piece really was the perfect match for the audience and purpose? I believe that students need feedback to not only be able to “improve” their writing but also to have the language to explain what they are doing to others. Excitement about a topic can carry a student for several days, but at some point the enthusiasm may wane as the task of rewriting or revising becomes laborious. So a learner would need to know the task/goal, be able to explain what he or she is learning and have some strategies that enhance his/her understanding of the work. 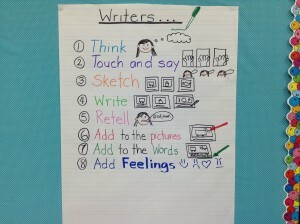 The checklists in the new Units of Study in Writing, from Lucy Calkins and the many, many talented folks at Teachers College Reading and Writing, would help meet those criteria especially if the students are involved in daily writing workshops that allow them to continually stretch and grow and there is a safety net provided by the teacher and peers. This is an example of “knowing specifically what a student needs to do” to meet the learning target in kindergarten – first grade writing. The student will have a “collection” of writings in a folder that will be evidence of learning. What will the parents and community members see? They will see examples of early writing in a unit and later writing. They will see “student revision” in work and evidence of student thinking. Parents and community members will not see traditional “percentages” for grades. They will see comments that delineate what the student CAN do. The students will be able to tell their families what they have been working on and how that has helped them be more powerful writers. And the teachers . . . How will they know that “students are improving”? Teachers may have to take a step back because the “day to day work” may cloud their view when they think of overall growth for all students. But student growth, when students are writing every day in writing workship for 45 minutes to an hour, can be seen after three weeks (Lucy Calkins, June 2013 TCRWP Writing Institute). Will it be easy? Heck, no! But will easy provide results that will help your students meet the demands of opinion, informational and narrative writing? What are you waiting for? February is the month to “Fire Up” student writing in your classroom. Your students will love writing with you! What questions do you have? What do you need in order to get started? What is your plan for the New Year – 2013? Last night, on the #educoach chat, participants were sharing their “Edu-lutions” for 2013. The archived chat is available at http://t.co/duEUIfKA if you would like to see what some very talented individuals are planning for 2013. Still thinking about one word to describe 2013 or your goal for 2013? Here are two more ideas. Are you interested in making a “one-word poster?” Here’s a link that will assist you in that endeavor. What is your plan, resolution, or edu-lution for 2013?